I hope you have been well and that summer is keeping you busy with lots of fun stuff. Hopefully you are able to find time to be creative too! I had a little play with the bold and beautiful Bohemian Bazaar line by Graphic 45. While I love bright, summery colours, I am often at a loss when it comes to creating with them and putting cards and layouts together. So, this week I challenged myself to create a layout and a card using this line for my Showcase Monday post on the Scrapbooker's Paradise blog. I loved this range so much, I even created a little bonus project with it that would make a beautiful gift for a little girl. 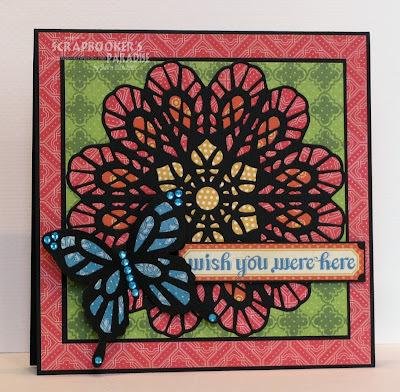 I hope you will pop on over to the Scrapbooker's Paradise blog to take a peak at the other projects. I have also included details on how I created each project, as well as a full supply list in my SP post here. I was blown away this morning Dawn! I really love what you did with these papers. The card is just absolutely stunning and such a creative use of those dies! Love, love, love! Oh, Dawn, all three projects are incredible! I love the stained glass effect, and the necklace is just stunning!